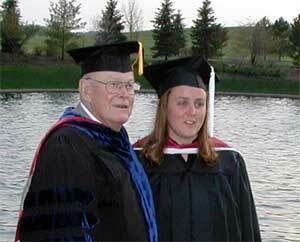 Cate is pictured with her grandfather, Dr. Wayne Moore, Professor Emeritus. Catherine (Cate) Ellis, daughter of Cam and Jeff Ellis, Ras Tanura from June 1982 to December 2002. Cate is a 2003 Honors graduate of the University of New Hampshire. She earned a Master of Arts in Exercise Science from Central Michigan University on May 7, 2005. Next stop, a job as an athletic trainer at a Division 1 school.